This is the aquarium that spills water but not the fish. 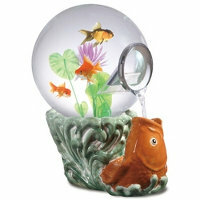 Water cascades from the side of the bowl–creating the illusion of an aquarium that’s perilously losing water–into the koi goldfish base, and back into the aquarium. A strainer at the spout prevents daredevil fish from plunging over the falls. You can see a video of this aquarium by going here.